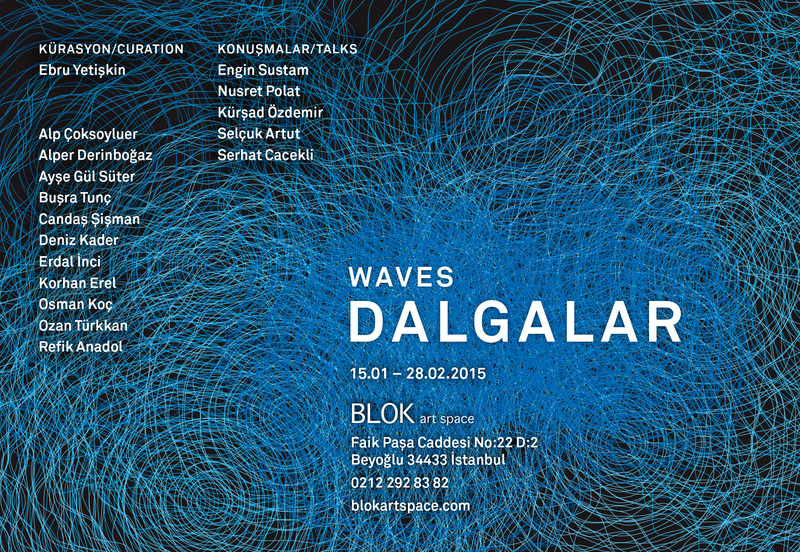 Curated by Dr Ebru Yetiskin, the exhibition Waves (Dalgalar) is definitely worth the visit at Blok Art Space in Istanbul. The exhibition features several of the key emerging names in the Istanbul technological art scene; beautifully installed across fitting space, Waves includes an implicit media historical reference in the midst of new works of rhythm, interaction and indeed, plenty of strings attached. The theme of strings comes out beautifully in how some of the work is installed, especially Candaş Şişman’s Re-conn-act with its vertical string pillars that offer a collective acoustics space and invite to touch this vibrating environment. By addressing the ubiquity of the wave form as a key symbol from sound waves to brain waves, financial cycles/fluctuations and social movements, Yetiskin aims to present an aesthetic entry point to the contemporary world and its modes of representation. One key reference point across the works resides in physics and the tension between waves and particles. One could also ask in the context of the works whether this tension is nowadays, or in the context of technical media, to be described as one of waves and discrete symbols (the Turing age)? The energetic waves and their rhythms are tightly interlinked with the discrete principles of computation. Or in media historical terms; the wave is build up of many layers, from the handwritten continuity of text, to physics experiments and models such as Helmholtz’s in the 19th century; to the principles of analog computation; the curves of mathematics and waves of sine and cosine, etc. : the ubiquity of the wave is actually part of a media archaeology of various stages, itself a wave, a recurrence. “Aesthetics seeks the essence of the artistically beautiful in its unconscious rationality. I have… sought to reveal the hidden law that determines the mellifluousness of harmonic tonal connections. Actually, this is something that happens unconsciously as far as the overtones are concerned, which are indeed perceived by the nerves but do not usually come forth into the domain of conscious ideation; nevertheless, their pleasantness or unpleasantness is felt without the listener knowing where the grounds for such feelings lie.” (Helmholtz, Über die physiologischen Ursachen der musikalischen Harmonie, lecture from 1857, published in Vorträge und Reden in 1896 90). Of course it has to be noted that in the case of the Waves-exhibition, often this “unconscious rationality” is algorithmic or in reference to the world of modern (quantum) physics. In a sense, one can approach the pieces of the exhibition as implicitly illuminating the various stages where waves appear and disappear in history. Some of the work is more tightly “media archaeological” such as Erdal Inci’s reanimation of the loop – GIF animations filmed in the real world, both representing a link to pre-cinematic short loop entertainment such as mutoscope reels and the digital short format as well. Many of the work, such as Korhan Erel’s “Findings”, investigates another media historical theme, i.e. the graphical print form of sound waves; intermedia on the level of spectral signatures of frequency/time. In general, the several pieces work nicely together. Besides the exhibition, the Waves-programme includes talks that range from physics to philosophy. 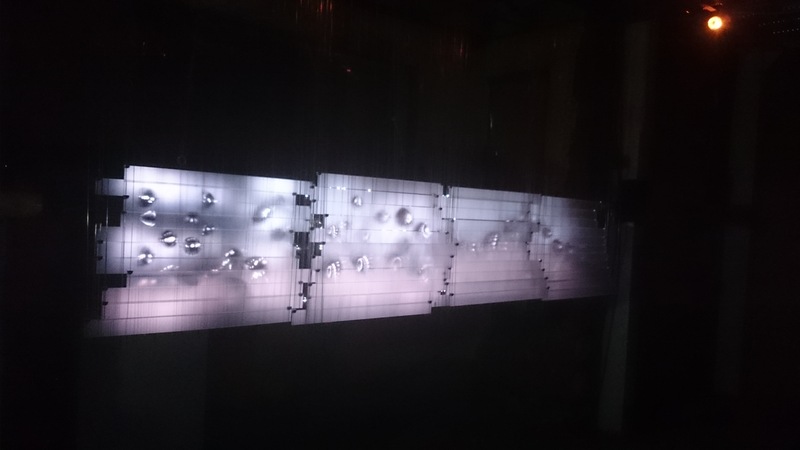 Büşra Tunç’s Sinusoid – a still from the moving image sculpture. Wish I could attend the globally noteworthy Waves Dalgalar.